Some skeptics of Christianity claim the doctrine of Christ’s physical resurrection from the dead was a later development, not something believed and proclaimed from the inception of Christianity. Others will admit that the doctrine was part of Christianity from its inception, but both groups claim the resurrection appearance pericopes that overtly stress the physicality of Jesus’ resurrection body were later inventions of the church. As evidence for this claim, they assert that our earliest gospels—Matthew and Mark—lack overt references to the physical nature of Christ’s resurrection. It is not until we come to the gospels of Luke and John that we find such pericopes. They hypothesize that in the latter half of the first century some Christians began proclaiming a non-physical resurrection of Christ, so Luke and John invented material to counter this teaching. While it’s true that we find more overt references to the physicality of Christ’s resurrection in Luke and John, by no means are they absent from Mark and Matthew. Mark 16:9-20 records Jesus’ resurrection appearances. Admittedly there are no overt references to a physical resurrection in this passage, and many scholars are convinced that they are not original to Mark’s gospel anyway. Even if we grant this, however, there is at least one clear indication in Mark’s gospel that Jesus’ resurrection was physical in nature. In Mark 16:6 we read of a young man who tells the women who came to visit Jesus’ tomb that “he is risen; he is not here. Look at the place where they laid him.” Such a comment only makes sense if “risen” is understood to include a physical, bodily resurrection from the dead. If anything else was meant by “risen,” the body would have remained in the grave. Matthew also includes pericopes that make it clear he understood Jesus’ resurrection to be physical in nature. As in Mark’s gospel, Matthew records an angel telling the women who came to Jesus’ tomb that “he is not here, for he is risen as he said. … Come, see the place where the Lord lay” (Matthew 28:6). Both the angel’s words and the historical context make it clear that a bodily resurrection is in view. Additionally, in Matthew 28:9 we read that the women “held” Jesus “by the feet,” a clear indication that Jesus possessed a physical body. Finally, Jesus is said to have predicted that He would be killed and “rise again,” or “rise again from the dead” numerous times in Matthew’s gospel (Matthew 16:21; 17:9, 23; 20:19; 26:32; See also Mark 8:31; 9:9; 9:31; 10:34; 14:28). That such talk of “rising” was understood to refer to a bodily resurrection is clear from Matthew 27:63-64. After Jesus was crucified, the chief priests and Pharisees requested that Pilate dispatch soldiers to Jesus’ tomb to guard it for three days because Jesus had predicted He would “rise” again after three days. The Pharisees feared that Jesus’ disciples would steal His body from the tomb to fake fulfillment of this prophecy. The Jewish response makes it clear that they understood Jesus’ prediction to refer to a literal, physical resurrection of the body from the dead. Matthew’s inclusion of the story, and his failure to note any misunderstanding on the part of the Pharisees makes it evident that Matthew understood Jesus in the same manner. When we come to Luke’s and John’s gospels, indeed, we find a number of overt references to the physicality of Christ’s resurrection—more than in Matthew and Mark. For example, Jesus tells the disciples to handle His hands and feet, noting that spirits do not have flesh and bones (Luke 24:40; John 20:20, 25-27). Jesus is even portrayed as possessing the ability to eat (Luke 24:41-43; John 21:13-15). But the evangelists also portray the risen Christ as appearing out of nowhere (Luke 24:36; John 20:19, 26), vanishing out of sight (Luke 24:31), and being unrecognizable to His disciples (Luke 24:13-31; John 20:14-15; 21:4). As N.T. Wright has pointed out, the latter descriptions are so incongruent with a normal physical existence that they have caused many believers to question the physicality of Jesus’ resurrection. If the evangelists were making up stories to correct the idea that Jesus’ resurrection body was not a physical body, surely they would not have invented stories that call this into question! We also have to consider the testimony of Paul since most of his writings predate Luke and John’s gospels, and probably Matthew and Mark as well. In Romans 8:10-11 and 23 he wrote, “But if Christ is in you, your body is dead because of sin, but the Spirit is your life because of righteousness. 11 Moreover if the Spirit of the one who raised Jesus from the dead lives in you, the one who raised Christ from the dead will also make your mortal bodies alive through his Spirit who lives in you. … 23 [W] ourselves also, who have the firstfruits of the Spirit, groan inwardly as we eagerly await our adoption, the redemption of our bodies.” (NET) According to Paul, the Spirit presently gives life to our spirit, but our body remains spiritually dead. In the future, however, God will also give spiritual life to our bodies through resurrection, just as He did for Christ. If God will do for us what He did for Christ, and what He will do for us is resurrect our physical bodies, then He must have done the same for Christ. In Philippians 3:21 Paul affirmed that Jesus “will transform these humble bodies of ours into the likeness of his glorious body by means of that power by which he is able to subject all things to himself.” (NET) For Paul, the object of resurrection is the body. Jesus will transform our bodies into glorious bodies, just like His own. Since Paul understood our resurrection body to be physical in nature, he must have understood Jesus’ resurrection body to be physical in nature as well. Paul was writing 15 years after the death of Jesus. If he believed in a physical resurrection of Jesus, the doctrine must have originated very early in the history of Christianity. One final reason for doubting the thesis that the doctrine of Christ’s bodily resurrection evolved in the latter half of the first century (or the thesis that while this doctrine was part of Christianity from its inception, the appearance stories that stress the physicality of Jesus’ resurrection body were later inventions) is that it makes no sense of the religious and historical context in which the Gospel was preached. Christianity was born in Judea, and its message was confined largely to Jews in the region of Judea for approximately a decade. Most Jews believed in a bodily resurrection from the dead. Gentiles, on the other hand, thought the notion of a bodily resurrection to be absurd. Why would the first Christians abandon a doctrine they inherited from Judaism—a doctrine that would make their message more palatable to their target audience—only to incorporate it into their message 10-15 years later during the Gentile expansion of the church? If you hoped to spread Christianity throughout the Gentile world, it would be counter-productive to your efforts to invent a doctrine that is considered outlandish to them. It makes much more sense to understand the doctrine as having developed early in Christian history, when Christianity was still confined to Jews who accepted the notion of a bodily resurrection from the dead. If the doctrine of Christ’s bodily resurrection was invented, we would expect for it to have appeared during the Jewish phase of the church, and then disappear (or at least be de-emphasized) in the latter half of the first century during the Gentiles expansion of the church. It makes no sense to believe that the doctrine would develop only after the Gentile expansion, or that Luke and John—who were writing for a Gentile audience—would invent material to emphasize the physical nature of Christ’s resurrection. If anything, we would expect just the opposite. This argues strongly for the historicity of the resurrection appearance pericopes they narrate. When Jesus was raised from the dead He appeared to the guards, who ran off in fear. They reported the incident to the Jewish elders. That they believed they had seen Jesus’ physical body is evident by the Jewish leaders’ response: They promised to protect the guards from a Roman inquisition if the guards would say Jesus’ body was stolen by His disciples (Matthew 28:11-15). Why invent such a lie unless they knew Jesus’ body was no longer dead, and His tomb was really empty? If Jesus’ resurrection was not physical in nature, the tomb would have remained occupied, and the story concocted by the elders would have been counter-productive. I think they would also have to discredit the entire 1 Cor 15. Thanks for posting this Jason. Good info. IMHO the witnesses to the resurrected Christ is the most potent testimony to the fact that He did rise physically from the dead. What is particularly compelling about the appearances of Jesus is that they are so broad in their diversity. Jesus didn’t just appear to one individual, but to many; not just to individuals, but groups; not just in one locale, but many; not just to believers, but to skeptics, unbelievers, and even enemies. Paul named the 500+ witnesses, noting that many of them were still alive. Why was that important? Because they could still be interviewed by anyone who wasn’t sure about Jesus’ resurrection. What do you think of the many witnesses who saw the Mormons’ gold plates? No witnesses did. They asked numereous times, but were always denied. The plates were never present during Joseph Smith’s “translation” of them. If your larger point is that witnesses cannot always be trusted, I agree. No one is accepting the testimony of the early Christians uncritically. There is good reason to trust their testimony. As I wrote to James, Jesus didn’t just appear to one individual, but to many; not just to individuals, but groups; not just in one locale, but many; not just to believers, but to skeptics, unbelievers, and even enemies. Such an impressive list of appearances would easily hold up in a court of law. Add to this the fact that the tomb was found empty, and there is good reason to believe that what the witnesses report seeing–Jesus alive from the dead–was true. If the tomb was not empty, then we would have reason to doubt that they were interpreting their experiences correctly. But with an empty tomb (which even the Jews conceded was empty), coupled with all of the various appearances, we have very good historical grounds for accepting their testimony. Question: When did he raise from the dead? The reason I ask is because christian tradition states Christ was crucified on Friday and rose on Sunday morning. That is not a full three days like Jesus declared would be. This may leave people to think it was all made up to begin with. I know, I know, a little off topic but I’ve been wondering more about this. Perhaps you can post about this in a future post? Thanks. He rose on Sunday, and was put to death on late Friday. You are right–that is not a full three days. But it doesn’t need to be because for Jews, saying “three days” does not require three full 24-hour periods of time (72 hours). Partial days count as days for Jews. Jesus was only in the tomb for ~1 hour on Friday, but the Jews counted that as 1 day since His entombment happened before the day ended. He was in the tomb all day Saturday (6pm to 5:59pm), and was in the tomb for ~10 hours on Sunday (assuming he rose around 4:00 am before the women went to the tomb at day-break. That is only ~35 hours in the tomb, but since Jesus was in the tomb part of Friday, all day Saturday, and part of Sunday, that was considered 3 days. If Jesus said 12 hours are in a day why would he expect us to redefine a day and night? I somewhat understand the Jewish customs of when a day begins but that doesn’t answer. This is important if we wish to discuss factually with none believers. Oh… forgot one more thing. Where is it in scripture does it state he rose on Sunday? From my understanding, which could be wrong, the discovery of the resurrection took place on Sunday. Yes, Jesus used Jonah’s experience as a type of his own, but that’s all it is: a type. It was not meant to be identical in all details. It falls apart if we want to press it for exactness. For example, Jesus was not in the heart of the earth. He was buried in a cave. If we take Jesus literally in Jn 11, then He made a grave error. “Day” has a variety of meanings both in Hebrew/Greek and in English. In saying a day has 12 hours, Jesus is only referring to the number of daylight hours in a day. In fact, if we use the logic of 12 hourse = 1 day, then Jesus was in the grave for three days since he was in there for 35 hourse (12 x 3 = 36). Surely that line of reasoning is mistaken. Let’s say you go on vacation. You leave Monday morning, and arrive late Monday night at your destination. You spend three full days there (Tues-Thurs), and then leave at noon on Friday. If I asked you how long you were on vacation for, or if I asked you how many days you spent at X and you told me “Five,” you would be accurate, and no one would even think of accusing you of lying. Why? Because even we today count partial days as full days. Only a beligerant fool would repond, “No, you were only there three days since Monday and Friday were partial days.” And that’s what a non-Christian is who wants to act as if Scripture is making an error here. There is no error. 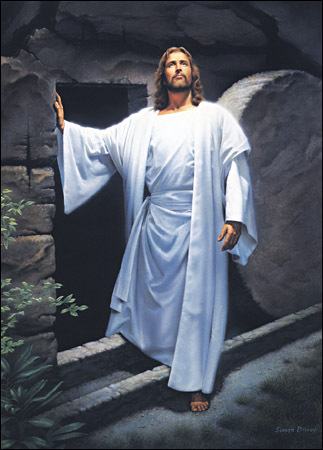 Jesus was in the grave on three different calendar days. Jesus said he would rise on the third day (Mt 16:21; 17:23; 20:19; Mk 10:34; Lk 9:22; 18:33; 24:46). Peter and Paul said Jesus rose the third day (Act 10:40; 1 Cor 15:4). Mt 28:1 and Lk 24:1 tells us it was the first day of the week when the women discovered the empty tomb. The first day of the week was Sunday. Jesus appeared to the two disciples on the road to Emmaus the same day as His resurrection. While the 2 disciples were talking to Jesus, they said it was the third day since Jesus had died (Lk 24:21). So the third day after the events had to have been the first day of the week; i.e. Sunday. Jesus’ actual resurrection is not recounted because nobody saw it except for the guards, and we are not told by the guards when it happened (they were paid to keep thei mouths shut after all). We do know that Jesus was raised prior to the women discovering His tomb empty at approximately 6:00 am on Sunday. Since for Jews the new day began at 6:00 p.m., 6:00 am on Sunday means Sunday was already 1/2 over when the women arrived. It’s entirely reasonable to believe that Jesus rose within that 10-12 hour period. And give the fact that Jesus said He would be in the grave for three days, it would seem to require that He be in the grave for at least part of the day on Sunday. Granted. Three Calendar days but it wasn’t three Calendar nights. If you take that brief window of day on Friday that he was buried and count that as one day. Then you count the Sabbath beginning at sundown or 6pm as one night then one full day (the Sabbath) then Sunday night at sundown until Sunday morning. That is two nights. Jesus said he would be in the heart of the earth for three days and three nights. Even though I may be wrong in my thinking I’m beginning to think it was three full days and three full nights. Or three full nights and early on the third day he rose and seconds after it was discovered. The analogy like all analogies holds some likeness. The main points of the analogy is the number of days and nights. If he was indeed buried on Friday then some will no doubt point out that it was only Three days (calendar days) and two nights (calendar nights). It is highly unlikely that Jesus would miss an analogy that bad. Like Jonah I will be in the heart of the earth for three days and two nights – that wouldn’t be like Jonah at all. Why even use the analogy? I’m not trying to be contentious but the traditional answer doesn’t work. Three days after being beaten and crucified he would arise. It seems to me, and I do stress the word seems, that Jesus was crucified on Wednesday or Thursday and rose on the Sabbath before 6pm. This would be exactly 3 nights and 3 days. There are some problems with this, one obvious problem is the preparation of the passover and the Sabbath when Joseph requested the body of Jesus to be buried. This is where I’m currently studying. Yes, I do believe he rose on the third day but early or late? It matters simply because of the three night clause. As you have pointed out we do not know at what time Jesus rose but we can be certain of this, scripture doesn’t say he rose on Sunday. It says that he appeared to the disciples on the same day as the discovery. As an aside – It would be wonderful to me that he rose on the day of Rest because of the spiritual rest he gives his saints with the resurrection power of the Holy Spirit! I’m so thankful for that Rest. But it doesn’t need to be three calendar nights. “Day” is very flexible. It can refer to a long period of time, 24 hours, daylight hours only, or to just a portion of a day. To say three days must also include three nights is to impose a definition of day that the Jews did not require, and that we ourselves don’t even require. I think you are trying to squeeze too much out of Jesus’ analogy to Jonah. If you want to insist that Jesus had to be in the grave for three nights because Jesus specifically said so, then why not insist that Jesus had to be in the heart of the earth as well? Even if Jesus had been buried in the ground rather than a cave, technically speaking He still would not have been in the “heart” of the earth. If you are not going to press Jesus on His description of where He would be, why press Him on His description of how long He would be there? As for Mk 10:34, if this is taken with exactness, then Jesus contradicted Himself because in other places He said He would rise on the third day. So which is it? On or after? If Jesus could say He would rise both on and after the third day without thinking that He was contradicting Himself, then maybe He didn’t think it was contradictory to say He would be in the grave for three days and three nights when in reality He knew it would only be two nights. Trying to get technical precision out of statements that are not meant for such precision should be avoided. You’re right. The Gospels portray Jesus’ death as happening on Friday before Passover. The astronomical data also confirms this. So why go to great lengths to try to move Jesus’ death to Thursday, especially when we know that for the Jews a partial day counted as a whole day (just like partial years counted as full years when reckoning the reign of kings)? The only reason for doing so is an overly literalistic interpretation of Jesus’ analogy to Jonah. But if one has to choose between not pushing an anology too far and disagreeing with other clear Biblical statements and the astronomical data, I think it more prudent to side with the latter. Also, I don’t what basis there would be for claiming that Jesus rose on Passover. Here Esther purposes to fast for three days — night and day. The words “and so” are more accurately translated “then.” But what does the next chapter say? 1. Now it came to pass on the third day, that Esther put on her royal apparel, and stood in the inner court of the king’s house, over against the king’s house: and the king sat upon his royal throne in the royal house, over against the gate of the house. And you are correct, Jason, that partial days are counted for whole days. I’m still studying and I do want to be clear that I am in no way be obstinate on my opinion. I just find the traditional story to be weak in several ways. Also I do not believe I said Jesus rose on passover. I said day of rest. Scripture does not declare Jesus rose on Sunday but the discovery was made. Speaking of astronomical date, the Jews used astronomical observation which could be flawed due to the weather. That means our date is much more accurate considering. I think Jesus’ words concerning Jonah was a little more than a simple analogy, that according to tradition fails. Jesus said it would be a sign. 3 days and 3 nights. As for the heart of the earth Jesus can use symbolic speach and still communicate literal truths. He did that with Nicodemas. Jesus would not have contradicted himself so, like I said I could be wrong on things. Scalia… I used patrial… I shouldn’t have. If I may retract that and insert “Friday wasn’t even half a day.” I’m tired! How much of a day do you need to make a day? I mean can i pray for 1 minute a day and declare I prayed all day? Praise the Lord, Brother CS! Sorry for the delay in getting back to you. You know the story — I’m very busy. I think your observations have merit. Christ did not say, “For as Jonas was three days and three nights in the whale’s belly, so shall the Son of man be in the heart of the earth.” That might leave some interpretive wiggle-room, but Christ repeated the time duration with respect to His death and burial. Moreover, you raise a valid point about praying one minute and claiming to have prayed all day. I don’t think Jason’s “heart of the earth” objection holds, because that is a clear personification. Personifications are very common and their use does not justify symbolizing everything in a sentence. I do think, however, Jason’s “third day” observation is valid. The Scriptures repeatedly tell us Christ rose on the third day. We thus have an insurmountable problem if we interpret both statements literally. To reconcile them, we would say Christ defines “third day” to mean after three days and nights, or vice verse. If Christ rose after being buried three full days and three full nights, then He resurrected on the fourth day, not the third. I know the SDA, et al, answer here, and I don’t dismiss it out of hand (not to imply your edging close to SDA) 🙂 I just think they run into the same logical difficulties. Since the Jews, under certain circumstances, counted partial days as whole days, and since we have Scriptural precedent for that (e.g. Esther), it appears the third day option is more consistent than the other. I understand my friend, you are a busy man. I am very iffy on which way to turn, iffy being no big deal since this isn’t a salvation type of question. It is a question of facts. The doubter will hammer on the details, so am I. I am leaning toward him rising on Sunday but I am not leaning toward him dying on Friday. The time line just doesn’t add up. Jason pointed to astronomical data being a factor but that would make Jesus dying in 33AD. If 33AD then Jesus would have been in his mid to late 30’s. I understand this is stuff that has been uncertain for a very long time. Thanks for your input. I’m trying to finish a study before Passover and will be teaching it to my church and do not wish to miss represent the events of the last week of our Lord’s life. I don’t think you are being obstinate. You are right that it does not say Jesus rose on Sunday, but I think Matthew’s account comes about as close as any as declaring it did. In Mt 28:1 Matthew depicts the women as on the way to the tomb early Sunday morning. Then in verse 2 he changes the scene, showing what is going on at the tomb. There, the angel rolls away the stone, and scares the guards (presumably away). I have no reason to believe the resurrection happened prior to the angel rolling away the stone, and since Matthew depicts that as happening while the women were on the way to the tomb Sunday morning, I think it’s safe to conclude that Jesus had risen very early Sunday morning, perhaps 5:00 a.m. or so. I have no reason to believe their judgment of the moon was flawed. Beside, the Passover was a fixed day each year. As for the astronomical data, it allows for either a 30 or 33 AD crucifixion date. Even if we go with a 30 AD date, Jesus still would have been in his mid-30s since He was born in 5-4 BC. The Bible doesn’t say Jesus was 30 when he died, nor even that He was 30 when He began to minister (it says “about” 30). He could have been 32, and that still would have been “about 30.” If He ministered for 3 ½ years, He would have been in His mid-30s when He died. I still think you are interpreting Jesus’ use of Jonah too literally. Given the fact that it is only an analogy, and analogies to not hold in every respect, I have no reason to hold Jesus to both three days and three nights simply because of the analogy to Jonah. True the circumstantial evidence points to a Sunday morning resurrection but… If you count back from Sunday you only get 1 (24 hour) day and part of another (24 hour) day and 1/8th of the next. If this is the case then the prophecy that Jesus gave of building this temple in 3 days is not true. You have 1/8th of a day Friday (of death but not entombed), a full day Saturday, then half a day Sunday (Counting from 6PM to 5AM), that leads to the question of what makes a day. Was Jesus being literal that in 3 days he would raise up the temple or was he being figurative? Does 1/8th of a day make a day? Can I fast and pray one minute each day for 3 days and declare I fasted and prayed for 3 days? (Don’t we wish it were that easy?  ) This is the logic I am using. Is it wrong? Lunar or Solar calendar? This may be where I am possibly missing the mark. In research I found that Moses used the Solar calendar but in the 1st century the Jews moved to a lunar calendar, was this the case? Was the Passover on Thursday every year? If this is the case then Friday was the first day of unleavened bread, the high Sabbath. Matthew 28:1 the Greek for Sabbath is plural for two Sabbaths. This is a slight problem due to the fact that the spices and ointments were prepared before the Sabbath according to Luke 23:53 but after the Sabbath according to Mark 16:1. It appears then that Friday could not have been a high Sabbath and Jesus was crucified on Wednesday (Passover Nisan 14 30AD) after celebrating the Passover with his disciples at dusk Tuesday (Wednesday for the Jews) night. He would have been placed in the tomb between death around 3PM and before 6PM on Wednesday because Mark 15:42, making Thursday the high Sabbath and allowing the preparation of ointments and spices on the day after the Sabbath and the day before the Sabbath. Or am I completely over studying this? Perhaps I am being too literal in what I’m reading but there has to be an answer that fits with the scenario that sometimes conflicts with one another. The crux would be the bible contradicts itself or does it? I don’t think it does so either it is mistranslations on our part or tradition is wrong. I understand why you are grappling with Jesus’ remark about three days and three nights, and why you would want to take Him literally, but when all of the other data points to the fact that He was not in the tomb for three full days or nights, why not just conclude that Jesus did not mean it literally? It’s not as though you are admitting a contradiction. You are simply acknowledging that for the Jews, when reckoning time, a partial day was counted as a day. Indeed, as I pointed out and Scalia seconded, you would have to say Jesus contradicted Himself because He also said He would rise on the third day (it’s hard to be in the tomb for three full days and three full nights and yet rise on the third day simultaneously). It’s just so much easier to understand Jesus’ reference to Jonah as being an analogy, and not requiring that Jesus fulfill it in every detail (no more than going into the belly of the earth). And it’s not as if this is an ad hoc explanation, because we know that this is how the ancients reckoned time. You have made it abundantly clear that you don’t like the way they did it, and I would agree with you. It doesn’t make much sense to me. But the problem is not with them; it’s with us. We can’t impose our own Western conventions of relating time to their own. They may be just as shocked to find out that we wouldn’t count 3 hours as a day as we are to find out that they would and did. I can’t say I have done an in-depth study on ancient calendars, but I’ve done enough study to say I’m 95% confident that the Jews always and only used a lunar calendar. In fact, they even had an extra month they would stick in their calendar every so often to make up for the annual gap caused by their lunar calendar. The Passover was a fixed day of the month, so the day of the week that it would fall on would change every year, just like the day your birthday falls on changes each year. And yet because they were on a lunar calendar, the day of the week could change quite dramatically from year to year (which is why the Passover would have fallen on a Saturday in both the years 30 and 33 AD, whereas in a solar-based calendar like our own there would have to be at least a 4-5 year gap in time before a particular calendar day would fall on the same day of the week again). As for Jesus’ age, the point of the text is not that Jesus just began to be 30 as the KJV implies, but that when he began his ministry he was about 30 years old. But since we know he was born no earlier than early 4 BC, and died no sooner than 30 AD, He must have been at least 34 when He died, if not older. I found some Biblical examples where partial days are counted as full days: Gen 42:17-18, 1 Kings 20:29, 2 Chron 10:5,12, Est 4:16,5:1, 1 Sam 30:12-13. And in case you argue that while you agree that partial days can be counted as whole days, the fact that Jesus specified three days and three nights means he is referring to whole days, pay particular attention to Esther 4:16 and 5:1 because these are very close parallels to what we have going on in the Gospels. Like in Mt 12:40, Esther told the Jews, “Do not eat or drink for three days, night OR DAY. … Then I will go to the king.” But in 5:1 we read that Esther went before the king “on the third day.” So even though she said she would go to the king after three days and nights of fasting, she went before the king on the third day. It must have been mid-day because it was before meal-time. Very good analysis. Very close to the truth, in my opinion (though I am somewhat skeptical that Jesus was crucified in 30 or 33 A.D. — my “research” indicates 32 A.D., for a variety of reasons; I’m not sure the calendar and astronomical data can be completely trusted, but perhaps so). Here is a link to a Facebook page I have on my Facebook profile that describes a discovery I’ve made that shows that God “coded” the Gospel into Nature (essentially via the length of a “Tropical” year [roughly 365.24219 days]): https://www.facebook.com/photo.php?fbid=4825854886087&set=a.4825065106343.1073741827.1287966475&type=3&theater . That “discovery” would indicate that Jesus was born in 5 B.C., that Jesus was crucified in 32 A.D., that Jesus was dead for about 36.5 hours (from 3 p.m. Friday until around 3:30 a.m. Sunday morning), and that Jesus was 36.5 “Biblical” years (360 days in length) old when He was resurrected. From what I understand, all of the above “indications” regarding Jesus fit all of the facts, history, and prophecies regarding Jesus’ age and time in the grave. And it makes sense that God would include in some way a very specific “coding” in Nature of the facts regarding Jesus’ life, death, and resurrection. It would be hard to imagine Him NOT doing so, anyway.